The file ETBoot.part4.rar is reported as broken, it is just left included for historical reasons. Edited by Nuno Brito, 01 March 2015 - 01:46 PM. More people can find it later. Downloading project and testing ill have to do in the weekend. Thanks for the Project. 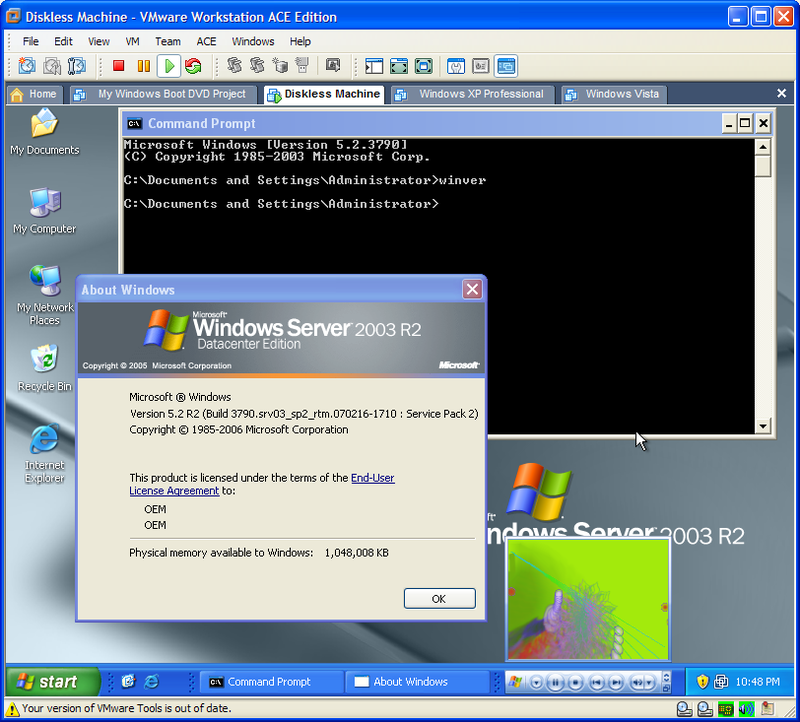 I am using VirtualPC for virtualization. Without any problems, I went thru all steps up to step 7. I have received message that Virtual Hard Disk.vhd is not valid. Edited: The same is valid for virtual disk made with VirtualBox!? How I can overcome this problem? Virtual hard disk (*.vhd) from Microsoft Virtual PC is not a flat hard disk image, it used proprietary format from conectix. You may need to use another method to get the correct hard disk image (That's why I included SelfImage in the .rar file). VirtualBox use it own format on virtual disk, so it is not a valid disk image. To do this, you will need another working virtual machine, make sure the target virtual hard disk are attached. Boot into the virtual machine, open SelfImage and then choose your target disk (entire disk) and save it as .img file. Do not use any compression method for saving disk image. Testet on vmware and 6 different systems. works like a charm !! a little slow until all hardware are detected, but then all installed programs works !!! I had a very quick look at it, it seems like REALLY NICE work. Most people only know/use first one (for DOS based images) and second one (for 2K/XP install CD's and the various PE's). Maybe you should specify that you use instead the third one. 3) XP installed in it uses already the default "Standard dual channel PCI/IDE controller"
c. The RAW disk image can be easily mounted with VDK.EXE (either directly or, if needed, through the use of a .pln descriptor file to have correct geometry), this way I guess one would not need the ETboot.iso at all, and just need running ETbootbuilder from the "real" machine. I choosen VMware Workstation because I used it frequently, and it was easier for doing my experiment. 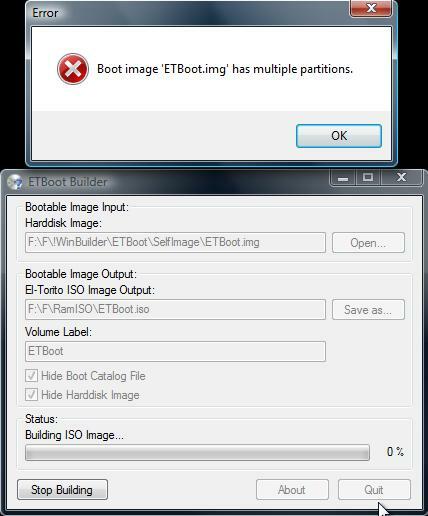 Some virtual machine will fail to boot the final ISO image generated with ETBoot Builder (maybe those VM software doesn't implement hard disk emulation boot correctly). I used ETPatchBoot.iso to install El Torito/EWF support because you can't access to some registry on normal user/Windows installation, unless you take ownership on the registry entry. ETPatch will work very well with user "SYSTEM" or using Windows PE based environment. Yep, I have seen that , I mean it would be useful to add this piece of info to the docs. A bit out of topic, can you share just the way (program and commands) you use to make this HD-emulation .iso? It is something I never found appropriate explanation about. I will try a build with your app under Qemu and post results. That is much smaller, but you can't backup the registry hive easily if corrupted (ETPatch built-in restore backup option). Very nice tutorial, Dhilip89! Unfortunately i'm at the moment in no position to test your little project. - Why has the size of the HDD image to be limited to belog 4GB? - Is it possible to put a second HDD image on the bootable DVD or will this somehow break the DVD? Since you're deeper into that matter than i am, can you tell me what eltorito.sys exactly does? All that i could find is, that it is a cdrom driver, but we already have one of those, cdrom.sys? eltorito.sys does mount the hard disk image volume on CD/DVD when booted with hard disk emulation mode. After successfully load the ISO image from CD, I tried to make it run remotely using tftpd32 with no luck. All my test finish with a BSO, anyone tried or have any cue. motote, first thing, welcome to the board. Well, since the project has been released only YESTERDAY, it may take a bit of time before it is tested AS IS, definitely some more time before all sorts of VARIATIONS will be introduced and possibly even some more time before these variations can be troubleshooted. I guess you'll have to wait a bit before anyone (apart the Author) gets enough hands on experience on this thingie here. with particular attention to point #d.
Hi all, it woould be very nice, to make such an XP on CD that boots any computer, like PE does. PS: What is abot the boottime? Only one partition are allowed in the hard disk image. That is not designed to use with PXE boot. But there is only one partition on my disk image!? Copy first 512 Bytes from your hard disk image using hex editor then post to here. I checked that MBR only contains one partition, maybe the issue with Windows Vista ? Try it under Windows XP. Or maybe it works only under VMWare?! I'm not sure it works under Virtual PC or not, I just tested with VMware.